Adventure is not limited to forbidding dungeons and grimy back alleys; sometimes the greatest risks and rewards are found in the gleaming halls of queens and emperors. 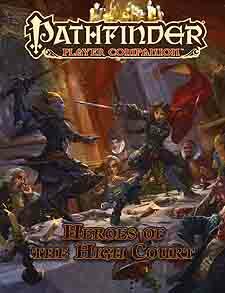 Pathfinder Player Companion: Heroes of the High Court presents everything you need to take your escapades into the royal courts and noble houses of Golarion. Learn how to dress and act in high society, gain access to the echelons of political power, and take advantage of the privileges afforded to those who have mastered the art of courtly intrigue. Archetypes for a variety of classes such as the court fool bard to the butterfly blade slayer, who performs a noble's dirty work in the shadows. Equipment and magical courtly regalia suitable for any ruler, including thrones that grant great power to whoever earns the right to sit on them.